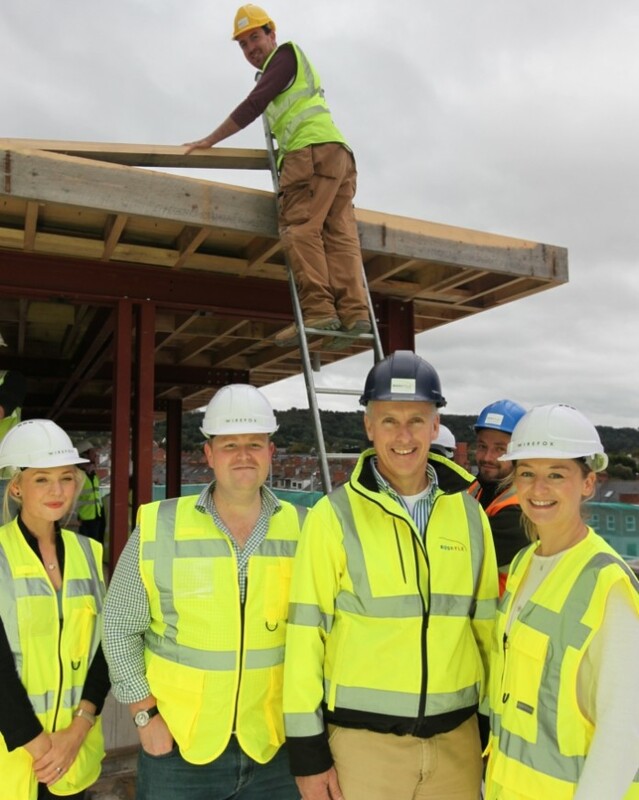 At the topping out ceremony for Wirefox’s new state-of-the-art office in Holywood’s Downshire Road are Emma Murtagh, the Wirefox architect who is leading the design and build project, BJ Eastwood, Wirefox Director, Colin Dougan, Roskyle Director, and Joanne McBurney, Wirefox Development Manager. Leading property investment and development firm Wirefox has turned to tradition to celebrate a milestone in the construction of its new £1.5m, state-of-the-art office at a former derelict site in Holywood. Reviving a popular industry tradition rarely witnessed in Northern Ireland in recent years, the firm hosted a topping out ceremony as the final beam was placed atop the new 7,500 sq ft building in the town’s Downshire Road. Following planning approval being granted in March this year, construction work began in June and is expected to be completed in December. The work is being carried out by Roskyle. Upon completion, the 20-strong Wirefox team, which has assets across the UK and Ireland, will move into the new facility from its current base at 10 High Street. “We are a modern property investment and development firm with traditional values. The topping out ceremony, an event which is held at construction projects throughout the world, helps recognize the hard work in planning and design, as well as the efforts of the Roskyle team. “This design acts as a showcase for Wirefox’s provision of top quality architecture alongside innovative interior and urban design, and is a further symbol of the firm’s ongoing business growth. “With a roof-top patio area and conference room as well as high-specification open plan office space and meeting rooms, the building will provide a spacious new accommodation for staff which will further enhance creativity. “The project also provides a major boost to the Holywood landscape and community, which Wirefox has been a part of for the last two years, with the investment a sign of our continuing commitment to helping grow the local economy. In keeping with tradition, attendees at the event celebrated the construction milestone with a glass of ale. Just last week, Wirefox announced an extension of its Scottish portfolio with the acquisition of a major retail-led asset in Dumfries town centre. This follows the recent purchases in Belfast city centre of Longbridge House and Oxford and Gloucester House.